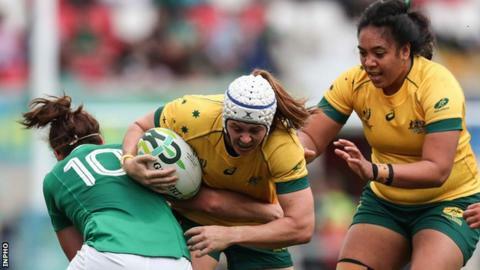 Ireland will face Wales in a seventh-place play-off at the Women's Rugby World Cup on Saturday after losing 36-24 to Australia in Belfast on Tuesday. The Wallaroos were deserved winners of the fifth-placed semi-final at Kingspan Stadium, scoring five tries to three by Ireland to secure a convincing victory. Sharni Williams, Sarah Riordan, Hilisha Samoa, Millie Boyle and Mahalia Murphy crossed for Australia. Ailis Egan, Alison Miller and Sophie Spence were Ireland's try scorers. Ashleigh Hewson kicked a penalty and four conversions for the winners, with Nora Stapleton and Hannah Tyrrell adding the extra two points to two of Ireland's touchdowns. A seventh-placed finish would secure automatic qualification for the next Women's World Cup in four years' time. Ireland had stuttered to a 17-15 win over Australia in their opening Pool C fixture and were again below-par in seeing off Japan 24-14 in their second game of the competition. Their ambition of emulating their achievement of reaching the semi-finals of the tournament three years ago ended with a 21-5 defeat by France and now seventh is the best they can hope for. Australia were rewarded for their bright start when Williams found a gap in the Irish defence and showed power and pace to dive over in the corner with just eight minutes on the clock. Lindsay Peat was held up short but her fellow prop Egan grounded the ball soon after and then Miller picked up the ball, went on a weaving run and shrugged off an attempted Australian tackle, before scoring under the posts. Riordan barged through to touch down, with Hewson's conversion bringing the scores level at 12-12, then Samoa rumbled over after a ruck to help ensure a seven-point advantage at the break. Australia had the momentum thanks to their dominance at the breakdown and through their ball-carriers at the gain-line, with their front row causing havoc in open play. They were further rewarded for their dominance when flanker Boyle ground her way over from close range and after Hewson added a penalty, Murphy collected an offload and scored under the uprights. Trailing 36-12, Ireland regained some pride when replacement Spence powered over six minutes from time and then number eight Fitzpatrick went over in the final minute after Boyle had been sin-binned. Australia will now battle it out for fifth place against Canada, who saw off Wales 52-0 on Tuesday. Ireland: Tyrrell; Galvin, Murphy, Naoupu, Miller; Stapleton, Cronin; Peat, Moloney, Egan; Cooney, O'Reilly; Griffin, Molloy (capt), Fitzpatrick. Replacements: Lyons, Van Staden, O'Connor, Spence, Caplice, Muldoon, Fitzhenry, McLaughlin.